Ruminococcus flavefaciens is an anaerobic, cellulolytic bacterium that plays an important role in the ruminal digestion of plant cell walls . CBM79 is a family identified in the Ruminococcus flavefaciens cellulosome. Two CBM79s (CBM79-1RfGH9 and CBM79-2RfGH9) were identified in an enzyme that contains a GH9 catalytic module with endo-β-1,4-glucanase activity . Both CBM79s bind to a range of β-1,4- and mixed-linked β-1,3-1,4-glucans . The ligand binding of CBM79-1RfGH9 was quantified by Isothermal Titration Calorimetry (ITC) and semi-quantified using Microarrays . CBM79-1RfGH9 binds barley β-glucan and hydroxyethylcellulose (HEC) with similar affinities of 104 M-1 . The small increase in KA from cellotetraose to cellohexaose (KA 4.2 x 103 M-1 for cellotetraose, KA 7.0 x 103 M-1 for cellopentaose and KA 4.9 x 103 M-1 for cellohexaose) suggests that ligand recognition is dominated by four sugar binding sites . The binding to xyloglucan is weaker than the other β-glucans, indicating that the protein cannot recognize the xylose side chains . CBM79-1RfGH9 binds regenerated (non-crystalline) insoluble cellulose (RC) with a KA of 4.8 x 104 M-1 . Mutagenesis experiments confirmed the importance of the aromatic residues in ligand recognition . Alanine substitution of Trp606 in CBM79-1RfGH9, which is conserved in the CBM family, resulted in complete loss of binding to all ligands . The mutants Trp564A and Trp607A retained affinity for barley β-glucan but did not bind xyloglucan . Alanine substitution of Trp564 and Trp606 resulted in loss of binding to RC . The importance of conformation of conserved aromatic residues on CBM specificity is evident in CBM2 members that bind to cellulose or xylan . CBM79 binding to non-crystalline polysaccharides indicates that CBM79-1RfGH9 is a type B CBM . Figure 1. Crystal structure of CBM79-1RfGH9. (PDB ID 4V1L, PDB ID 4V1K). The aromatic residues that contribute to ligand recognition are shown. The structure of CBM79-1RfGH9 was solved using single-wavelength anomalous diffraction (SAD) methods and selenomethionyl protein to a resolution of 1.8 Å . CBM79-1RfGH9 displays a beta-sandwich fold in which the 12 antiparallel β-strands are organized in two β-sheets 1 and 2 (Figure 1) . β-sheet 2 forms a cleft in which aromatic residues are a dominant feature . The ligand binding site located at the concave surface of the protein forms an unusual solvent exposed cleft/planar surface for a type B β-glucan binding CBM. It is not a narrow canyon-like structure as displayed by CBM78. Tyr563, Trp564, Tyr597, Trp606 and Trp607 in CBM79-1RfGH9 form a twisted hydrophobic platform within the cleft . 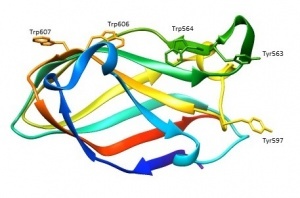 Two tryptophan residues (Trp564 and Trp606) play a key role in ligand recognition adopting a planar orientation in CBM79-1RfGH9 . CBM79 fulfills an enzyme-targeting role that is specific to Ruminococcus . R. flavefaciens forms a multi-enzyme cellulosome complex that plays an integral role in the ability of this bacterium to degrade plant cell wall polysaccharides . CBMs generally display specificities consistent with the activity of the appended enzyme. R. flavefaciens CBM79-1RfGH9 and CBM79-2RfGH9 are components of an enzyme that contains a GH9 catalytic module . The specificity of CBM79-1RfGH9 for β-glucans is consistent with targeting the endo-β1,4-glucanase activity of the GH9 catalytic module to its substrate . CBM79 from the Ruminococcus flavefaciens CBM79_1RfGH9 and CBM79_2RfGH9 were the first CBM79 members characterized . The first available crystal structure and the first complex structure of a CBM79 is from CBM79_1RfGH9 . This page was last edited on 30 August 2018, at 01:59.